Best Hiking Trips, Trails, and Tips for Beginners | You Need to Know. Searching for the best beginner hiking trips, trails and reviews? In this article we explore where you, the beginner, should go on your next outdoor hiking and camping adventure. Be sure to bookmark and share this article with friends! A lot of new backpackers dream of stuffing a 60L backpack full of gear and heading into the woods. What’s the worst that could happen? Well, without the right prep, there’s a lot that can go wrong with your a beginner’s first journey with a backpack. In fact, being under-equipped in the backcountry can have life-or-death consequences. Ask any seasoned backpacker what’s the biggest mistake newbies make, and it often involves green backpackers underestimating the demands of the backcountry. You need the right gear like an extreme weather shelter, a cold weather sleeping bag, and a comfortable backpack – the so-called Big 3. You need some survival skills. And you also need to plan carefully. A Plan B is always smart too; you never know when a trail might be washed out or you’ll need to exit early. But, most importantly, you should work your way up to more challenging treks. Start with something a little less ambitious. You shouldn’t attempt the 100 Mile Wilderness on your first try. And a three- or four-day trip can quickly become miserable, if not dangerous, if you don’t know what you’re doing. Instead, shoot for a two-day, one-night trip on your first trip. That’ll give you a chance to test your gear, learn-by-doing and see what hiking is all about. The five best beginner treks in the U.S.
And High Sierra Camps Loop in Yosemite National Park. Bottom line, these five outdoor hiking trips offer it all: incredible scenery, moderately challenging trekking, and unique, under-the-stars experiences. Without further ado, these are the five best hiking trips and trails for beginners in the United States of America. In Zion National Park, Utah’s epic geological formations are on full display. And the West Rim Trail provides the best vantage for all of it. You’ll get stunning views of the reddish-orange sandstone walls of Zion and Refrigerator canyons, from top and bottom. One tip: Be sure to bring your camera! Most backpackers choose the top-down route. This takes you from Lava Point (7,890 feet), the highest point in the park, to the floor of Zion Canyon below. From the top, the hike starts with gentle stroll through the sub-alpine pine forests of the Horse Pasture Plateau. The trail eventually begins to descend into the canyon. The descending path is carved right into the western walls of the canyon, and a series of knee-thumping switchbacks get you to the canyon floor. Over two days, this makes the perfect beginner hiking trip. You’ll be able to fully savor the majesty of Zion. And once you reach The Grotto picnic area – the trail’s terminus – on day two, you can explore many of Zion’s other natural wonders, including The Narrows, The Subway, or Angel’s Landing, if you’d like to extend your stay. You can catch the trailhead at Lava Point Overlook campground, a great car-camping spot if you want to camp out the night before. This is a point-to-point, or one-way, trail. That means you’ll need to use a shuttle. One of the best options would be to park a vehicle in Springdale, Utah – where there are numerous park-and-rides for the Zion shuttle. After you reach The Grotto, you can shuttle out to one car in Springdale and head back to retrieve the other car at Lava Point. best hiking trip and trail in utah. Zion can get crowded in early summer/spring and fall, so you’ll likely run into trail traffic, especially after you descend into the canyon. Still, the West Rim isn’t nearly as crowded as The Narrows, and the upper reaches are actually quiet. Be prepared for incredible scenery. The canyon views from West Rim are unbeatable! Camping at the West Rim Trail: There are nine campsites along the West Rim Trail, some requiring advanced reservations. The campsites near seasonal Cabin Spring are best for breaking up the two days. If you start later in the day, the Potato Hollow campsites work well. All even-numbered campsites require advanced reservations, which can be made through Zion’s permitting website. You can reserve odd-numbered sites one day prior to your departure at the main Visitor’s Center. Permitting: A backcountry permit is required for any overnight stay in Zion. Permits are made when you reserve a campsite. They cost $15.00 for 1-2 people, $20.00 for 3-7 people, and $25.00 for 8-12 people. If you’ll just be day-hiking, you don’t need a permit for the West Rim. Weather: Early-summer and fall are the best times to travel in Zion. In early spring, the upper portions of West Rim, near Lava Point, might still be covered in snow. But by late-May, most of the snow has melted. In summer, temperatures can regularly reach into the 80s and 90s, and therefore, it’s best to travel in fall or spring, when temperatures are in the 60s and 70s. Overnight temperatures can drop into the mid-40s in early summer and fall; cold-weather sleeping bags and a 4-season tent are necessary. Water: Along West Rim there are two areas where you can filter water. At Potato Hollow, there’s a year-round spring that flows. The other spot is the seasonal Cabin Spring. A filter is necessary, as the water can be a bit silty at both locations. 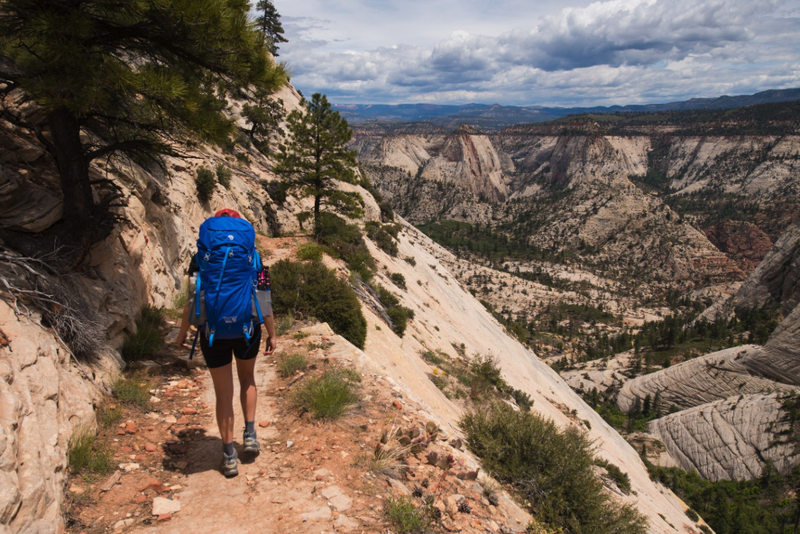 Bottom line: West Rim Trail is a perfect introduction to hiking in Utah. Start with this trek and work your way up to multi-days in Canyonlands and Arches. This is our favorite beginner hiking trip in the USA, but we have more awesome backpacker trips below. The nearly 23-mile jaunt between Hawksbill Peak and Swift Run Gap shows off the splendor of Shenandoah. Your trek starts with a gentle climb to the top of Hawksbill Peak – a 4,051-foot mountain with sweeping views of the Blue Ridge Mountains. In fact, it’s the highest place in the park. After you gawk from the top of Hawksbill, the hike continues on the park’s major thoroughfare, the Appalachian Trail. Along the way, you’ll be treated to some of Virginia’s best wilderness. Pass by hidden waterfalls on gentle, well-kept trails, see President Herbert Hoover’s historic Rapidan Camp, and stop to take in the views from Point Overlook. This a perfect two- or three-day trip. On a two-day trek, start from Hawksbill and stay in Lewis Mountain Campground overnight. That’s about two 10-milers each day. Or as a three-day, you can take your time. Camp in Big Meadows the first night, and backcountry camp near The Point Overlook the second night. Park in the Hawksbill Gap parking lot located near the peak trail. The parking lot does fill up, especially on holidays and summer weekends. So get there early. This is a point-to-point trek, and you’ll need to shuttle between Hawksbill and Swift Run Gap. You can park overnight in South River Falls picnic area, and shuttle back for your car at Hawksbill. 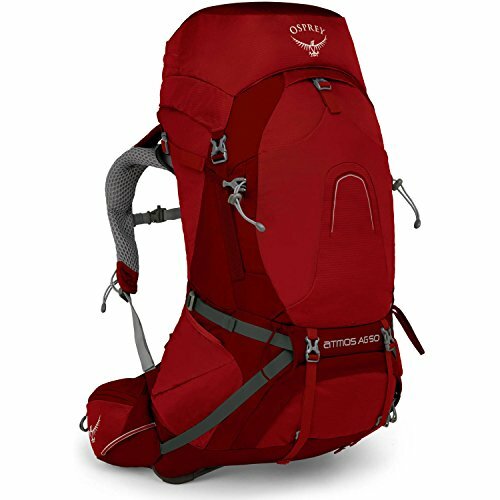 If you’re new to carrying at 25-pound pack on your back, this is the perfect beginner hiking and backpacking trip. There aren’t many strenuous climbs, and after you make it to the top of Hawksbill in your first mile, the trail is mostly downhill with just a few casual ascents. Beyond that, the weather tends to be mild May through October. Just be forewarned, the park gets a lot of weekend traffic in summer; reservations are highly recommended. Camping on the Trail: There are several established campgrounds in the park, including Big Meadows and Lewis Mountain. Lewis Mountain is first-come, first-served year-round, and a smaller campground. Big Meadows is first-come, first-served in spring only. In summer and fall, reservations are required. Backcountry camping is permitted, but follow the rules when it comes to selecting a camping spot. Permitting: Backcountry permits are required for anyone traveling in park. These permits are free and can be obtained at any visitor’s center or entrance. Additionally, there is an entrance fee for vehicles of $30. Weather: Shenandoah is blessed with mild weather throughout the year. In spring, temperatures hover in the mid-50s, but can drop overnight into the 30s. By June temperatures climb to the 70s, with lows in the 50s. Hammock camping is great in summer. Weather is mild into fall. Temperatures in the 60s in September and 50s in October are common. Water: Big Meadows campground has water, but Lewis Mountain does not. If you have a water filter, you’ll find plenty of streams to harvest water from along the route. Maps and Info: Check out the NPS’s website for information about camping and hiking in Shenandoah. National Geographic’s illustrated trail map is another great resource. Hawksbill to Swift Run gives new backpackers a taste of the Appalachian Trail and Virginia’s colorful backcountry. It’s a gentle climb, resources are close-by, and that makes it a perfect beginner overnight. This hiking trail is one of the best we’ve found for beginners who want a challenge, but also comfort knowing that you are not alone on the hike. The Ozette Trail provides a sneak peek of Olympic National Park’s legendary coastal trails. It’s a gentle walk on rain-forested boardwalks and the park’s to-die-for wilderness coast. This isn’t the kind of trip that requires peak physical fitness. You won’t be climbing up crags and summiting peaks. In fact, you can do this as a dayhike. But as an overnight, Ozette gives you the chance to camp with waves crashing in the background. The trip takes off from the Ozette Lake Campground, which is located in the northwest corner of the Olympic Peninsula. The trail is a triangle – who would have guessed! – with Ozette, Sand Point and Cape Alava serving as the three corners. From Ozette, you can hike counterclockwise, heading the 3.4 miles to Cape Alava, or clockwise, three miles to Sand Point. You’ll be welcomed by tons of natural charm along the way. Stroll through lush rainforest during the first leg, before you reach the wonderful, pristine natural coast. Sea stacks, seals and occasional whale sightings are just a few of the experiences to look forward to. Plus, you’ll be camping near the beach, so just be sure you make it in time to take in the sunset. best hiking trip and trail in olympic national park. The Ozette Lake Campground is the jumping off point for this trip, and it’s easily accessed via Highway 112. You can also stay in Clallam Bay or Sekiu prior to departing. The three miles of coast on the Ozette Triangle can become impassable at high tide. The National Park Service provides tide safety info. And be sure to carry a tide table with you and plan your trip at low tide. Fortunately, there are bypass trails, if you do get stuck. Ozette is popular too, especially from Memorial Day to Labor Day; reservations are recommended. Camping: Camping is permitted at Sand Point and Cape Alava. Both of these sites are equipped with pit toilets. And while camping, bear canisters are required for your food. The raccoons are clever on the coast! Bear canisters can be rented from Wilderness Information Centers. Campfires are only permitted at Cape Alava, and can be made with driftwood. Permitting: Wilderness Permits are required to camp in the backcountry. And reservations are required May 1 through September 30, via email, mail or walk-in. Permits are $8 per person per night. Whether you confirm by email or mail, you’ll receive a confirmation. Bring this to the Wilderness Information Center in Port Angeles to get your permit. Weather: Rain is common along the coast, especially in spring, winter and summer. A weather-proofed backpack is necessary, and you can even get away with doing this trek with a large daypack. Temperatures are fairly mild throughout the year; 40s and 50s in winter, 60s in spring and summer, and 50s in fall. Just be sure to pack good rain gear! Water: There are water sources at both campgrounds. Just be sure to bring a filter. Also, the water may have a tea-colored tint, which is due to tannins from the native foliage. But don’t let the color fool you; it tastes great. Maps and Info: The National Park Service’s Ozette Loop page is a great source of information, and provides trail conditions, reservation info and other helpful links. The National Geographic’s Olympic National Park illustrated maps are also helpful. Ozette is the perfect prep hike for the North Coast Route, Olympic’s most beloved coastal trail. Plus, it’s a casual stroll, which is great if you’re looking for a relaxing backcountry trip. best trip and trail near lake superior. Overview of CASTLE DANGER TO GOOSEBERRY FALLS. The Superior Hiking Trail is a hidden gem for beginners! This 310-mile stretch, running from Duluth, MN up to the Canadian border, offers the best of the best in Midwest hiking. Visitors get sprawling, 180-degree views of Lake Superior from high bluffs, meandering manicured trails through red pine forests, and a close-encounter with Gooseberry Falls, the icing on the cake. Really, there are numerous beautiful overnights on the Superior Trail. But this 9.3-mile point-to-point is perfect for beginners. The terrain is gentler – although the scamper up to Wolf Rock right out of the gate is a bit challenging – and the scenery and views from Wolf Rock and Mike’s Rock are impressive. You can hike this section April-November. But the best time is in early October. The fall colors start peaking, and you’ll be rewarded with some of the best autumn reds, oranges and yellows in the Midwest. Plus, you can extend your trip with a night in Gooseberry Falls State Park, which has established campgrounds for a night of car camping. You pick up this hike at the Castle Danger Trailhead, which sits about 40 miles north of Duluth, MN. The trailhead can be accessed via MN-61 and West Castle Danger Road. This is a point-to-point hike, so you’ll have to shuttle back from Gooseberry Falls. The trail, at least until you reach Gooseberry Falls, is fairly quiet. There’s not much trail traffic, but it does pick up in July and August. One point to note: The mosquitos bite during the summer months. An early-spring or post-Labor Day trip can help you avoid them. Camping: There are five campsites with pit toilets along this stretch. They’re available first-come, first-served, and they do not require permits. You can also camp in Gooseberry Falls State Park, if you’d like to add another night to your itinerary. Permitting: Backcountry permits are not required when hiking on the Superior Hiking Trail. But you will need to pay an entrance fee for parking in Gooseberry Falls State Park. Weather: By early May, temperatures hit the mid-50s, and it’s one of the best times of year to travel here. June, July and August have temperatures in the 60s and 70s, while the fall has milder temperatures in the low-60s and upper-50s. Hammock camping is great! By October, overnight temperatures can drop into the high-30s. If you’ll be camping in late fall, bring a heavy-duty sleeping bag and cold-weather tent. Water: The first three miles of the trail don’t offer access to reliable streams, but once you reach the Gooseberry River, you can filter the water there. Maps and Info: The Superior Hiking Trail Association is a great source of useful resources, including maps, trip overviews, trail conditions and closures. Bottom line: Castle Danger to Gooseberry Falls provides just enough challenge to push beginners. Plus, the scenery and views of Lake Superior are worth the trip alone. A strenuous hike in the High Sierras… That doesn’t sound like the best trip for beginner. But the High Sierra Camp Loop is a bit different. And yes, it’s actually great for beginners of all abilities and hiking skills. High above Half Dome, you’ll find five backcountry camps. Each of which serve up hot breakfasts and dinners and provide backcountry accommodations and water. best hiking trip and trail in yosemite national park. In other words, this trip is high-country hiking, without having to lug all the gear with you. In fact, you can trek the loop with a larger daypack; everything you’ll need is available for you at camp. And with an average of eight miles between each camp, even the most novice can make it. That’s why this is the perfect beginner backpacking and hiking trip. It’s the ultimate practice for multi-day hikes at higher altitudes. And the scenery and camp camaraderie make it well-worth the visit. You’ll be treated to epic views of Half Dome, wildflower-pocked meadows, alpine swimming holes, and dozens of beautiful backcountry lakes. If you want an adventure – albeit with a bit of help – the High Sierra Camp Loop makes a lot of sense. All of the treks take off from Tuolumne Meadows Lodge. It’s recommended to stay overnight at the lodge to acclimate yourself to the higher altitudes – Tuolumne is 8,600 feet and the highest camp is 10,300 feet. There’s parking at the lodge, as well as accommodations. The High Sierras isn’t an easy hike by any means. In fact, it’s strenuous in several locations. But with a much lighter pack, that makes the trip more manageable. You can hike this loop a few ways. There are guided and unguided trips, in which you stay in one of the bunk tents with breakfast and dinner included. And there are meals-only trips, in which you camp at a backcountry site nearby and eat at camp. Camping: The bunk-style tents are large canvas structures with about 16 bunks in each, and they have minimal accommodations. A top-quilt is great or a lightweight sleeping bag, as it will help you cut down on weight in your pack and keep you warm. Plus, each tent has a small wood stove to keep you warm all night. Permitting: If you book a guided, unguided or meals-only trip, your reservation counts as your permit. Backcountry permits if you’ll be hiking the loop on your own. This is a highly popular loop, and the lottery for reservations is competitive. Typically, reservations open in October or November for the next summer. Meals-only. Backpackers camp. Wilderness permit required for meals-only guests. Permit is your reservation if guided or unguided. Weather: The High Sierras get quite cold, no matter the time of year. You’ll need cold-weather gear, although since the tents are heated by stove, you’ll stay pretty warm. Temperatures reach the upper-50s and 60s by July. But no matter the time of year – and this loop is only open from late-May/early-June through September – the weather can change. Prepare for the worst. Water: All of the camps have potable water, and a few – if it’s available – have water for warm showers. Alternative Plans: If you don’t have the time, you can split the trip up. A half-loop trip takes you to three of the camps. Maps and Info: Check out Yosemite’s website for all the information about this trip, including reservations, maps, and packing lists. Be sure to acquaint yourself with the lottery system. High Sierras Loop gives you the chance to experience epic Yosemite backcountry hiking, without the hours or planning and provisioning. It’s perfect to get you prepped for high-altitude overnights. What Are Your Favorite Beginner Hiking Trips? There are tons and tons of incredible overnight and multi-day trips in the U.S. That makes it so hard to narrow it down to just a couple. Think we missed on of the best? Let us know. Connect with Angel Outdoors on social media and give us the scoop on great backcountry trips for beginners. And be sure to check out our gear guides for advice on the best of the best in camping gear, including tents, backpacks, sleeping bags, hammocks, lights, and more.